Gold has underperformed many assets classes over the last few months or even for last few years, and seems to be losing the safe haven title. Comex gold prices have been in a corrective mode falling from $1365 to making lows of $1160 in a span of six months. But in the last couple of months gold, has been consolidating in the range of $1,180 and $1,220, despite high volatility in the dollar following escalating trade war concern between the US and China. The trading range for gold has been very narrow, but prices on the domestic bourses have been elevated primarily on the back of weakness in the rupee which has weakened by over 14% (YTD). Trade tension between the US and China have taken center stage in global geopolitics, where the US until now has announced a few rounds of imposition and hinted to impose more sanctions. We have seen similar retaliation from China, but that too hasn’t impressed gold much. Dollar, on the other hand, has gained following better-than-expected economic numbers from the US. Most economic data released from the US have been impressive thereby keeping losses restricted for the dollar. Another important factor that will be important is US 10-year yields that have risen to the highest level in mid-2011 – following better than expected economic numbers, hawkish comments from the Federal Reserve and as an escalation of the trade war between US and China could help curb down the nation’s trade deficit. U.S. yields and gold have had an inverse correlation and that rising uncertainty across the globe could attract investment in US bonds and thereby also support gold prices in the future. On the trade war front, the US is now looking at Russia and Japan and could look to impose tariffs, along with its ongoing concerns with China. Over the last couple of years, inflation concerns globally have receded, but the rallying crude oil prices and trade tariffs are bound to add to inflationary pressure on many nations and pressurize their currency. Crude and Gold generally go hand in hand as shown in the adjoining chart, but of late the connect seems to have lost. We expect that gold prices are likely to catch up on the lost momentum. Despite the correction in gold prices, buying interest in ETFs has remained subdued. We expect that lack of global cues could keep volatility low for gold, but on domestic bourses, prices could continue to gain on weakness in rupee. Market participants will be keeping eye on US inflation and preliminary consumer sentiment number to gauge view on the dollar and at the same time that will impact gold prices. Sentiment has been pessimistic in Gold as suggested by CFTC data which shows record net short positions ever. This makes it a fantastic contra-trade opportunity. 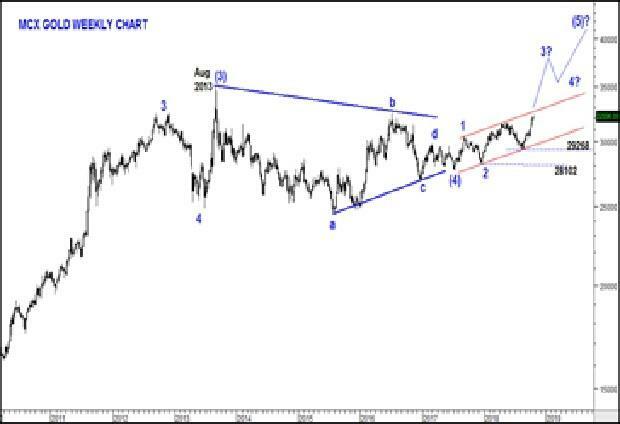 MCX Gold has been consolidating within Rs.35075 – 24500 for the past five years in the form of a symmetrical triangle. Recently, a breakout occurred above Rs.31600 indicating a continuation of the prior uptrend. Symmetrical triangle target comes around Rs.35500 – 36000 area. Key supports are seen at Rs.29250 – Rs.28100 levels. As per Elliott Wave analysis, 5th wave of the primary degree uptrend seems to have started in the price. Wave 4 was a symmetrical triangle which got completed near Rs.27600 level. Within wave 5, we seem to have completed initial 1-2 wave structure and wave 3 is in progress. We expect the 3rd wave to extend to at least the previous high near Rs.35000 mark. As per Dow theory, higher highs – higher lows structure is intact indicating bullishness. In a nutshell, the breakout of a symmetrical triangle and a supportive Elliott wave count suggests a prolonged uptrend. In our opinion, the long-term target of the commodity is Rs.42000 which could get achieved in the next 18-24 months.